For the first time, the majority of Build-To-Order (BTO) flats launched will be built using a new pre-fabricated method that reduces the number of workers needed at construction sites, said the Housing Board yesterday. Under this new construction technology, the lower number of workers needed at construction sites means safety hazards and inconvenience to the public will be minimised. This method allows buildings to be constructed in a Lego-like manner, with building modules being fabricated in offsite factories. It is a major part of the Government's push towards raising productivity in the construction sector, as laid out in the industry's transformation map launched last month. PPVC flats will come with floor and wall finishes, internal doors, window frames, sanitary fittings and a base coat of paint. The HDB will not be offering the Optional Component Scheme (OCS) - which allows BTO-flat buyers to pick these furnishings as an option - with PPVC flats. Some prospective buyers said it was still too early to tell if there is a difference between homes built using PPVC and those using traditional on-site methods. Said Ms Jessy Chia, 25, a retail manager: "It's great news for buyers only if (the use of PPVC) means flats are built cheaper or faster, and these savings come back to us." 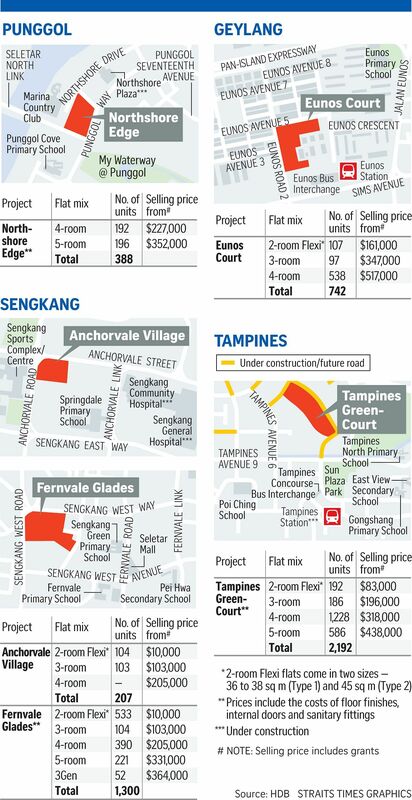 Another 3,401 units under the Sale of Balance Flats (SBF) are also on offer, bringing the total in this exercise, lasting from yesterday until next Monday, to 8,230 flats. Application for new flats launched in the November 2017 BTO and SBF exercise can be submitted online on the HDB InfoWEB from now until next Monday. Applicants can apply for only one flat type/category in one town, under either the BTO or SBF exercise. The next BTO exercise will be in February next year, when the HDB will offer about 3,600 flats in Choa Chu Kang, Geylang, Tampines and Woodlands. A concurrent Re-offer of Balance Flats exercise will also be held.